In keeping with my theme for this weekend, today was again uneventful. I ran a couple of errands and did some cleaning around the house. Really, the only out-of-the-ordinary thing that I got up to this Sunday was washing my pug which, as those of you who are pug parents well know, is no easy task. Given pugs' propensity to be fussy bathers, not to mention their assorted health challenges, I've become something of an expert on DIY dog bathing. You don't need to take your pooch to a groomer every week in order to le pup clean. Bath your dog regularly. If you bath your dog every week (like I do) or every other week, you'll help to keep your dog's skin and coat healthy. Also, when you bathe your dog at regular intervals, the task of keeping them tidy wont be quite so gargantuan. Plus, the more you bathe your dog, the more use they will be to taking a bath . . . and the less fussy they will eventually become! Know your dog's challenges and use the correct, high-quality grooming products. Dogs, like humans, have different types of hair/fur textures and skin challenges; as such, it is important that you select a shampoo and conditioner for your dog that is made specifically for dogs and that addresses your dog's particular challenges. For instance, pugs as a breed generally have dry skin and thick, short undercoats; so, I use a soothing shampoo that also moisturizes her coast and calms her itchy skin. Again, also make sure that you are selecting a shampoo that is made for dogs and that is of a high quality; I personally suggest using John Paul Pet Products which you can purchase online or in your local human salon. Using a product that is made for dogs allows your pup to still smell like a canine; if your dog doesn't smell like a dog to other pups, they run the risk of being attacked. Don't forget the extras! When you are preparing to wash your dog, don't forget the Epi-Otic to clean your dogs ears, wipes to clean their muzzle, dental wipes or gauze to clean their teeth, or the soothing ointment, like Bag Balm, for your dog's pads. Note: I prefer to use Epi-Otic to ear wipes because the solution breaks up excess wax inside of the ear canal, not just in the outer ear. When not to wash your dog: when they have stitches; when it's raining; when they've just had a flea treatment; when they have been injured and are currently recovering; when they have previously been upset; when you don't have time to do a thorough, careful job; when you don't have all of your materials ready to go; when you're in a bad mood; right before they're due for a bathroom break; any time you don't feel like you can devote your focus to the task. 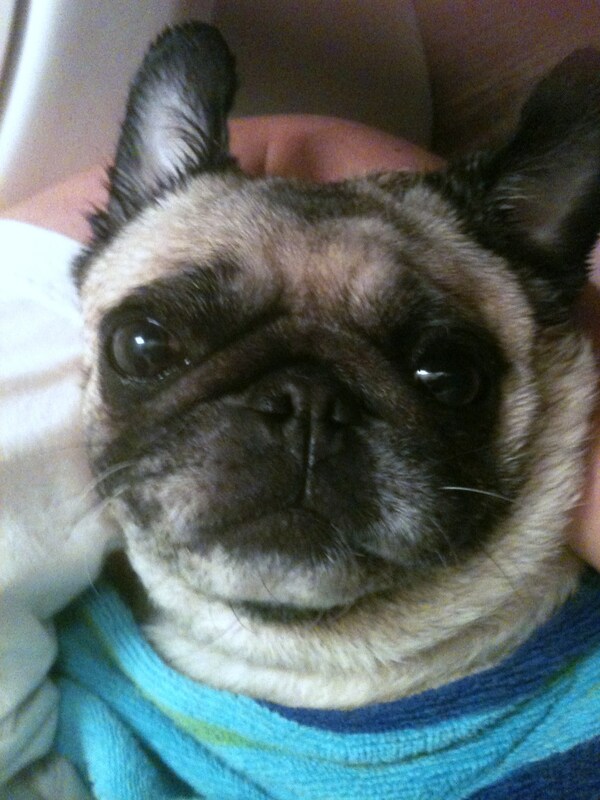 Washing, Step 1: After you have put your pup into the bath, start with an Epi-Otic to clean your dog's ears. Squirt a small amount of the solution into your dog's ear canal then massage the cartilage behind your dog's ear, which helps to break up any excess wax. After you've massaged the ear, allow your dog to shake the solution out of their ear; then take a clean cotton ball and clean any access wax that has now collected on the inside of your dog's ear flap. Repeat the process for the next year. Washing, Step 2: Wet your dog down with warm (but not hot!) water and start scrubbing them with your high quality dog shampoo. Make sure that you keep the suds out of your pup's eyes, scrub their legs, and check their paws for any scrapes or injuries. Once you've worked your dog into a nice lather, rise your dog making sure to use either your hands or your small tumbler to gently poor water over your pup; I do not recommend using a hose or a shower attachment for this purpose, you run the risk of upsetting your dog or splashing soap into their eyes. Washing, Step 3: Use a conditioner to help improve the quality of your dog's coat and skin. Follow the procedure for washing in regards to conditioning. Drying: Lift your dog out of the tub and place them on a towel; take a second towel and place it over your dog's head; allow your dog to shake themselves. Using the two-towel system allows your dog to do what they naturally do-- shake themselves when they are wet-- while making the task of drying them far simpler. 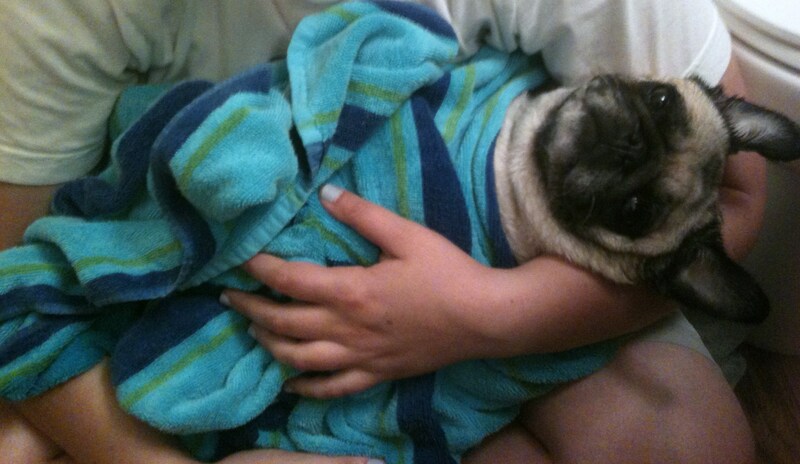 The Burrito: If your dog is small enough, use the towel you have placed over your dog to swaddle them up, like in the picture below. Make sure to not bind your dog uncomfortably, but to swaddle them and keep them in your arms while you tend to their other grooming needs; it is often a good idea to have an adult partner at this phase in the grooming. Ointments & cleaning their muzzle: While your dog is in the burrito, carefully take one of their paws out at a time and apply any ointments to their pads (especially important in the cold of winter and heat of summer, when paws can get dry or painful). Also take this opportunity to use a wet wipe to carefully clean your dog's muzzle; make sure, if your dog has folds on his or her face, to carefully clean between their creases. Teeth cleaning: While your dog is still swaddled in the burrito, take a piece of soft gauze and wrap it securely around your index finger. Take your index finger and carefully rub the front and back of your dog's teeth to remove some of the plaque. Make sure that you aren't rubbing hard and that you keep a careful hold of the gauze-- you don't want your dog to eat the gauze or choke on it, so be careful with this step. After your dog has been washed, dried, beautified, and covered in lineaments, they are now ready to run around the house . . . and get a yummy reward for their cooperation. What steps do you follow when bathing your own dog? Let me know below!